How can I purchase an add- on plan for my Freedom plan? I received my bill and I don’t understand the charges. What are the requirements to purchase this plan? How much must I pay for the deposit of the plan? It depends on which Freedom plan you sign up for. See below table. What will happen to the deposit? This will be settle with the outstanding bill of the 6th month. Will the previous plans still be available? Yes, but they will not be offered anymore to new customers. Customers who are already making use of the previous plans, will be given the opportunity to sit out their contract period.During their contract period these customers have the opportunity to do a plan upgrade. Will you be still connected to Digicel or will your contract end? You will still have your postpaid account. The account will stop after the contract period only when you indicate this. How can I check the balance of the minutes? You will receive unlimited minutes to Digicel numbers local. How can I check the balance of the SMS messages? You will receive unlimited SMS for local nummers (teleg,digicel). 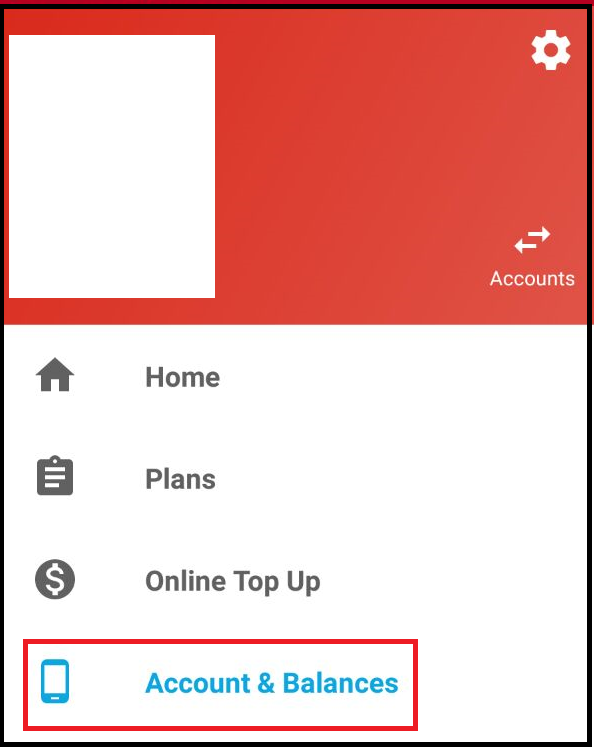 You can check your data balance when dialing the code *120*3# or through the My Digicel app. You will then receive below message about your data balance. In the My Digicel app. 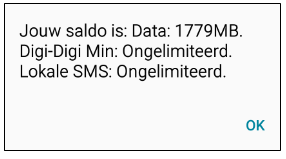 At the option “Data Balance” you will see the total amount of GB/MB data. Can I make international calls with the bundle minutes? No, with the bundle minutes you can only make local Digi- Digi calls. Can I use the SMS messages to SMS all local providers and international? The SMS messages are only for local network (Digicel/Telesur). Can I use the SMS to participate with the Text to win promotion? No, you will have to top up credit to participate with the Text to win promotion. How many GB’s customer receives when activating this plan? How long are these plans available? All plans are 30 days valid. How long are the MB’s of the add-on valid? The MB’s of the add-on data plan will roll over to the next month, if not used. Will the roll over data option be applicable for these plans? Yes. This will be applicable for both the data plan as the add-on plan. 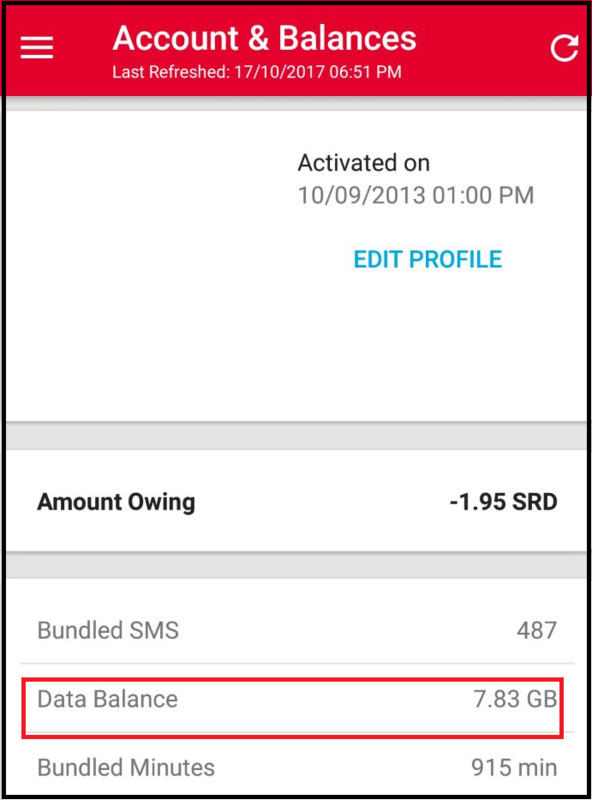 With the roll over option you can take the unused data into the next month until a maximum of 20GB. You will never lose any MB of unused data. Is there a credit limit for this plan? What will I see when see when dialing *120#? You will see the below message. How many credit can I top up? You can top up any desired amount. What happens to the credit when I top up? With the top up credit you can make calls to: Telesur, international and taxi numbers. 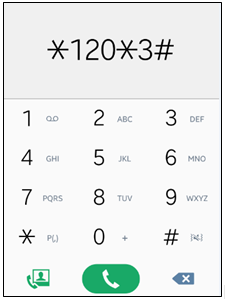 SMS to international numbers, buy a roaming or add-on plan. In short, everything that’s not in your package/freedom plan. Can I activate the current local voice bundles? What are the charges for making local (to other networks) and international calls? The rate for calling to local network (Telesur) is SRD1, 40 per minute. For calling local (to other networks) and international numbers the normal prepaid rates apply. Call 100 or click here to ask an customer care agent this information. Can I make use of Credit U/Me and Top Up Advance? Yes, these products are available for the freedom plans. If my account is warned, can I top up credit? You will be able to top up credit, but you will not be able to make any calls. Can I roam with this package? Yes, you will be able to roam, according to the prepaid roaming rates. With the Freedom plan you are able to purchase the Roam Like Your Home service for only SRD63,68. The amount will be deducted from your credit. For this you will need to top up credit. The Roam Like Your Home service is 7 days valid. Click here for more information.